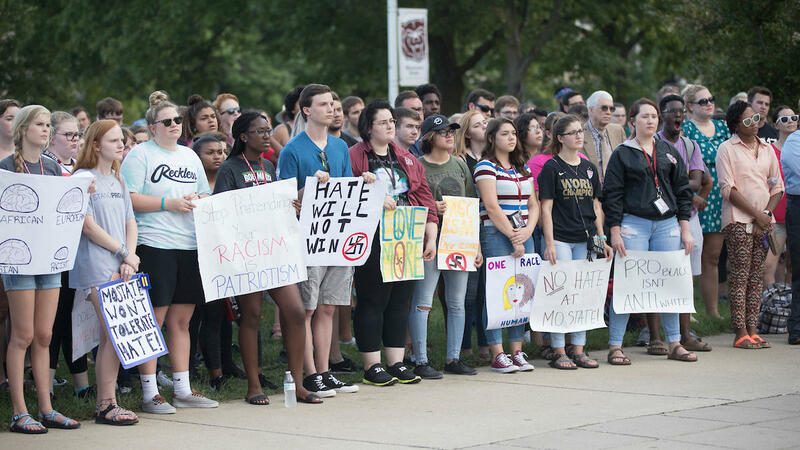 Students, faculty, staff and community members stand against racism on MSU's Springfield campus in Aug. 2017. There’s a program at Missouri State University that teaches community members how to notice and challenge racism. The Facing Racism Institute at MSU is hosting a two-day workshop in Springfield. Businesses and individuals are welcome to attend. The workshops include dialogue and exercises. According to a release from the university, organizers hope to teach people how to create inclusive spaces for others. The workshops will be held on Oct. 4 and 5 starting at 8:30 in the morning on the MSU campus. Tickets for the two-day institute are $350 for MSU employees and $400 for community members.